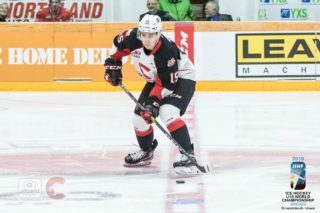 The remarkable stretch of play at home continued Tuesday night for the Prince George Cougars. 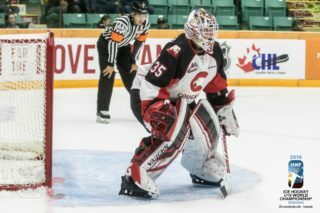 Ty Edmonds did his part in goal stopping 31 of the 33 shots he faced and Jesse Gabrielle notched a goal and an assist for the Cougars in a 3-2 victory over the Portland Winterhawks. The Cougars scored the first three goals of the game and survived a late surge from the Winterhawks who have now lost two straight. The Cougars held a 2-0 lead after the first period thanks to a pair of quick goals before the 5:08 mark of the period. First it was Aaron Boyd who redirected home a Tate Olson point shot past Adin Hill and home for his third of the season at 2:46. Then 2:22 later the Cougars made it 2-0 when Chase Witala and Jesse Gabrielle teamed up on a nifty passing play in front of the Portland goal. Witala made a slick little back-door pass to Gabrielle who tucked home his team high 15th goal of the season to put the home team ahead by two. After one period the shots were 14-11 Portland, as both goaltenders faced their share of rubber in the opening frame. The second period would yield some great chances at both sides, but neither Adin Hill or Ty Edmonds would relent for their respective teams. Hill’s best save came off of Brogan O’Brien on a Cougars power play chance, while Edmonds’ best came off of Rihards Bukarts from in close. The Cougars held a 24-22 shot advantage after 40 minutes, and took their two goal lead into the final period. Just past the midway point of the third, Josh Anderson scored what would prove to be a valuable goal for the Cougars when he blasted home his first of the season from the top of the left circle while streaking down the wing. Anderson’s goal was assisted by Gabrielle. Back came the Winterhawks who finally solved Ty Edmonds with 6:30 remaining in the third period when Paul Bittner knocked home a Dominic Turgeon rebound from in close on a power play. For Bittner it was his ninth of the season, and it gave Portland their first goal in over 150 minutes of action dating back to last weekend. Portland then inched a little closer with their net empty when Keoni Texeira slid his fourth of the season past Ty Edmonds with just 33 seconds remaining. That’s as close as they’d get to the comeback. 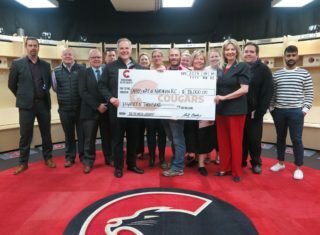 The Cougars dug their heels in and held the Winterhawks off the scoreboard for the final 33 seconds of the game giving them their 14th victory of the 2015-16 season. The final shots favored the Cougars: 38-31. 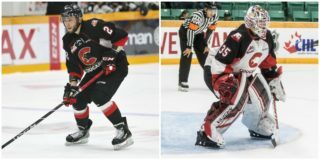 It was a milestone victory for Cougars netminder Ty Edmonds who now with 55 victories sits alone in third place in the all-time victories list for Prince George Cougars goaltenders. 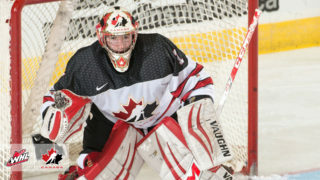 It was also his second victory in a row after winning Saturday against Kamloops. Now the Cougars will look to keep their home winning streak alive when they go head-to-head with the Portland Winterhawks again tomorrow night at the CN Centre.